The fact that initial unemployment claims keep making record lows does not mean what Wall Street and its Big Media PR flacks want you to think it means. First time claims for unemployment compensation continued their string of record lows for the same week of the year. The actual number, not subject to any seasonal hocus pocus was 263,427. That was just 1,858 claims per million employed workers last week. That compares with 2,270 per million in the same week of 2006 just as the housing bubble was on the brink of deflating, and 2,294 in that week of 1999 as the internet/tech bubble was peaking. We use actual data, as opposed to the seasonally manipulated headline numbers which Big Media shovels out for mass consumption. To see from the actual numbers if there’s any evidence of trend change we must look at how the current week compares with the comparable week in prior years. The actual change for the current week versus the prior week was a decline in claims of -27,633. The 10 year average for actual data for that week was a decrease of -22,688. The same week last year saw a decrease of -23,233. Week to week changes are noisy. The trend is what matters. Since 2010 the annual change rate each week has mostly fluctuated between -5% and -15%. Last week was within that range with a year to year drop of -7.9%. A persistent shift to a year to year increase in claims would be a sign that the US economy is headed for recession. That has yet to happen. The stock market is a key. When it weakens, employers normally take their cues from that. The Fed knows that businesspeople watch the stock market and often base hiring and firing decisions on its direction. A weakening market would not only make the Fed even more cautious about attempting the charade of raising rates, it would at some point possibly even put QE back on the table. In spite of all the evidence from Japan, Europe, and the US that QE stimulates only financially engineered bubbleization and not real economic growth, central bankers continue to believe the economic mythology that it does. So the Fed has been cowering in reluctance to shrink its balance sheet and return to any semblance of a “normal” monetary policy. In the meantime, the Fed has enabled and encouraged financial speculators and corporate executives to carry out a massive skimming operation which impoverishes an ever increasing portion of US households. Likewise, businesses have acted out a low-pay job hoarding bubble in response to the signals from the Fed QE-driven stock market bubble that has only recently stopped bubbling. Employers saw the housing bubble beginning to deflate in 2006 and reacted accordingly, starting to lay people off that year. Stock traders were the last to get the news as the Fed kept growing its System Open Market Account (SOMA) at the then “normal” growth rate of 5% through mid 2007, when it stopped, before shrinking the SOMA late in 2007 and 2008. The Fed stopped growing the SOMA last October. Since then stock prices have leveled out. But employers continue to hoard their low paid workers. The longer this goes on, the closer we come to the next “adjustment.” It won’t be pretty. I chart and analyze the real time Federal Withholding Tax data in the weekly Wall Street Examiner Pro Trader- Federal Revenues report. It has been an excellent predictor of final revised non farm payrolls and GDP. In the Tale of Two Economies, massive gains accruing to the investor/speculator/corporate mafiosi class skew the headline economic numbers positive while the bulk of the American people experience no gains. QE and ZIRP have caused Ben Bernanke’s trickle to pool at the top with the banker/speculator/investor/corporate looter crowd. Meanwhile, the vast majority of American families have seen their household income stagnate for more than a decade as QE and ZIRP create perverse economic incentives that work to their detriment. The ever increasing economic drag which that creates will eventually result in negative top line numbers, but we aren’t there yet. Record low claims are the patina of policy success that Wall Street and the dangerous, corrupt media empires that spread its propaganda use to anesthetize and hypnotize the public. The data hides the basic truth that most Americans are not doing well economically. 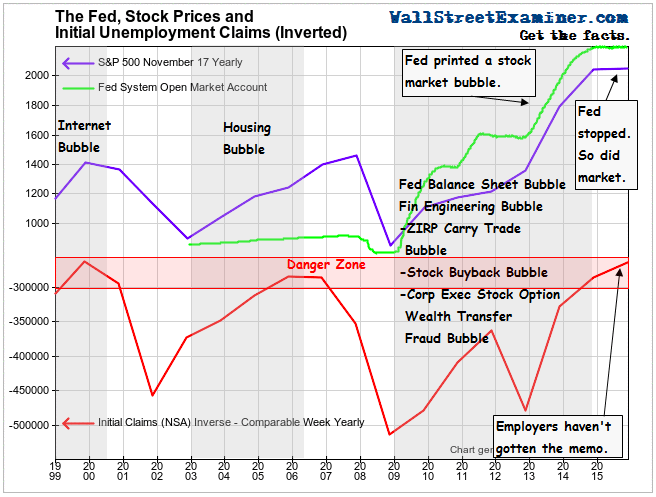 These record claims represent a bubble that was born out of and is joined at the hip with the financial engineering bubble that has been metastasizing in the US economy for a generation. We can thank central bank policy for the economic divide it has wrought and for the long term adjustment that lies ahead. The stock market faces the problem of reduced long term profitability that will ultimately result if most Americans can’t afford to buy the products and services that corporate America produces. 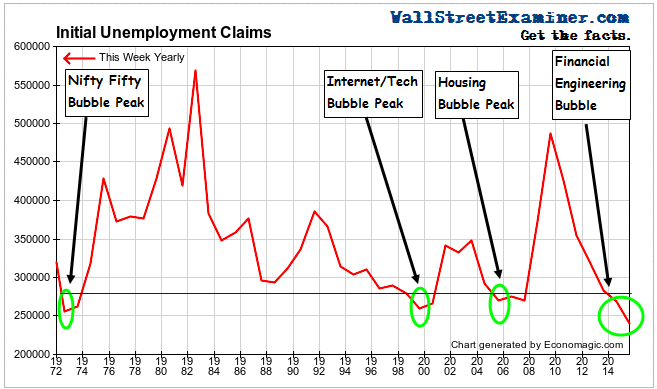 If you are new to these reports, here is a review of the key historical antecedents of the extreme readings on initial claims from a post, August 13, 2015.